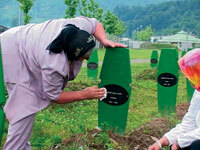 In July 1995 Serbian forces entered the mainly Muslim town of Srebrenica in North-east Bosnia. Twenty thousand refugees, mainly women and children fled to the UN base at Potocari, but thousands were ultimately handed over to the Serbs. The Serbian troops separated men and boys from women and small children. Most of the women were then bussed out; others were raped, tortured and murdered. The men were taken away to be slaughtered, their bodies dumped in mass graves. Forensic scientists are still uncovering the truth about what really happened at Srebrenica. The perpetrators of the massacre went to enormous lengths to hide the evidence; former Bosnian Serb leader Radovan Karadzic and his military subordinate General Ratko Mladic - both indicted for war crimes - have evaded capture for ten years. But there is now a bigger political process at work as all sides try to move towards a better and more secure a better future for the Balkans. One reason for this new determination is the prospect of the Balkan States joining the EU. "Highly recommended for library collections supporting programs in international relations, European studies, human rights, and genocide."